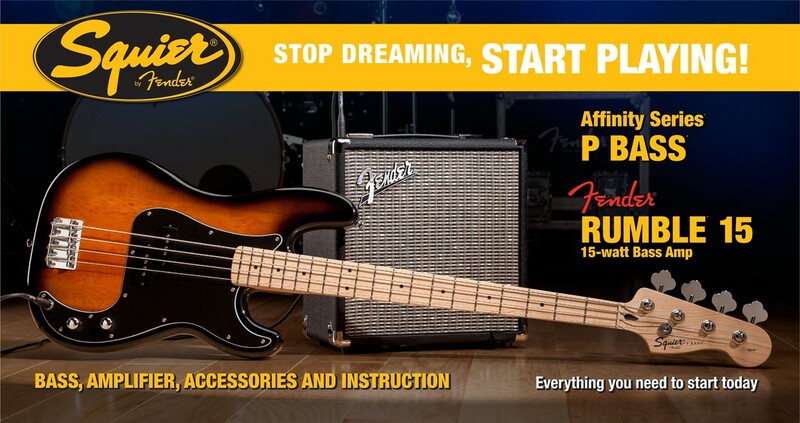 Get classic electric bass sound and style with the Squier Stop Dreaming, Start Playing! Set: Affinity Series Precision Bass with Fender Rumble 15 Amp. This package includes a traditional Fender-style Squier Affinity Precision Bass, with a comfortable neck and a timeless P Bass split single-coil pickup, delivering the rhythmical tone responsible for several genres of contemporary music. It's paired with a 1 x 8" Fender Rumble 15 combo bass amp - a perfect practice amp with a stereo aux input and a headphone out for silent practice. Top it off with a complete accessories package, and this Squire Affinity Series Precision Bass set is an excellent deal. If you want classic Fender P Bass thump and thunder, then the Squier Affinity Series Precision Bass included in this package is a great place to start. Just like the classic Precision Bass that introduced the electric bass to the world, this instrument features a split single-coil P Bass pickup that offers an exceptional range of tone from woody jazz to punchy rock sounds. What's more, the Affinity Series Precision Bass's narrow J Bass neck style (just 1.625" at the nut) is particularly comfortable for anyone who's putting in the hours of practice required to learn how to play. If you're going to learn to play bass, then you're going to need a solid bass amp, and the Fender Rumble 15 is perfect for the job. This 15-watt, 1 x 8" bass combo amp's refreshingly straightforward design includes volume, bass, mid, and treble controls, which let you dial in a wide range of amp tones. Plug in your media player via the 1/8" stereo input and jam along to your favorite tunes, and when you want to practice late at night, the 1/4" headphone output lets you rock out in silence. One the reasons why Sweetwater Sales Engineers love the Squier Stop Dreaming, Start Playing! Set: Affinity Series Precision Bass with Fender Rumble 15 Amp is that it comes with everything you need to get started - no surprises here! Included are a quality electronic tuner, gig bag, guitar cable, and strap. There's also an instructional DVD with exercises you can use to start building the skills right away. Overall, it's an amazing value.